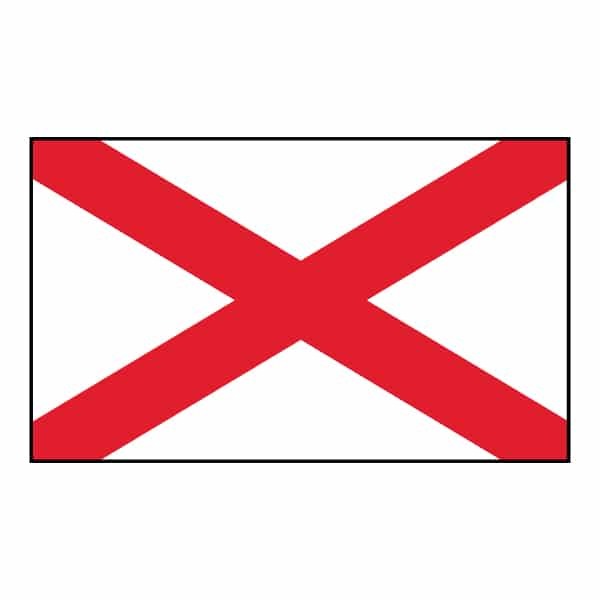 The current Alabama state flag was adopted in 1895 and is the second flag of Alabama. The flag contains the cross of St. Andrew cross, known in vexillology as a saltire. The bars of the cross must be at least six inches wide. In 1519, Spanish explorers arrived at Mobile Bay. Explorer Hernando de Soto visited the territory in 1540. The first permanent settlement in Alabama was Fort Louis de la Mobile founded by the French in 1702. In 1763, the British gained control of the area by the Treaty of Paris but had to cede almost all of Alabama to the United States and Spain after the American Revolution. Alabama became the 22nd state on December 14,1819. Montgomery is the Alabama state capital. The state of Alabama was named after the Alabama River which was named by early European explorers after the Indian tribe that lived in the territory and first appeared in 1540 spelled as “Alibamu”, “Alibamo” and even “Limamu” in the journals of the Spanish explorer Hernando DeSoto (c.1500-1542). The origin of the name Alabama is thought to come from a combination of two Choctaw words; Alba and Amo. In Choctaw, “Alba” means vegetation, herbs, plants and “Amo” means gatherer or picker. “Vegetation gatherers” would be an apt description for the Alabama Indians who cleared much land for agricultural purposes.